This is a guest post from Tan Your Mind, Outpost’s web series in Thailand. We’re looking for two hosts for our second season—click here to learn more. As we walked down the cricks and cracks of the tracks and over the bridge, passed throngs of people taking selfies, some with heavy-hanging heads, others eating snacks and holding hands, I made a point to count. One sleeper, two, three, four… 25, 26, 27. I wouldn’t feel right walking aimlessly here or letting my mind wander too far or trudging carelessly across the wooden beams that held us up. Even in moments where my eyes drifted to the large temple across the murky water, a glassy mosaic that scattered the sun back at us, I’d catch myself bring my eyes right back. 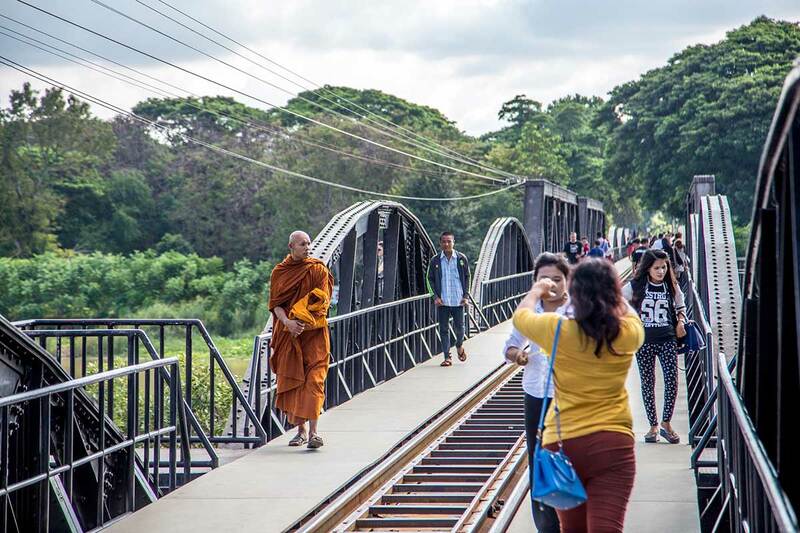 The bridge on the River Kwai today: More selfies than solemnity. They say one person died for every sleeper laid down on the tracks. As it happened, today is also Remembrance Day. The death railway is another patch in the global quilt of the Second World War. 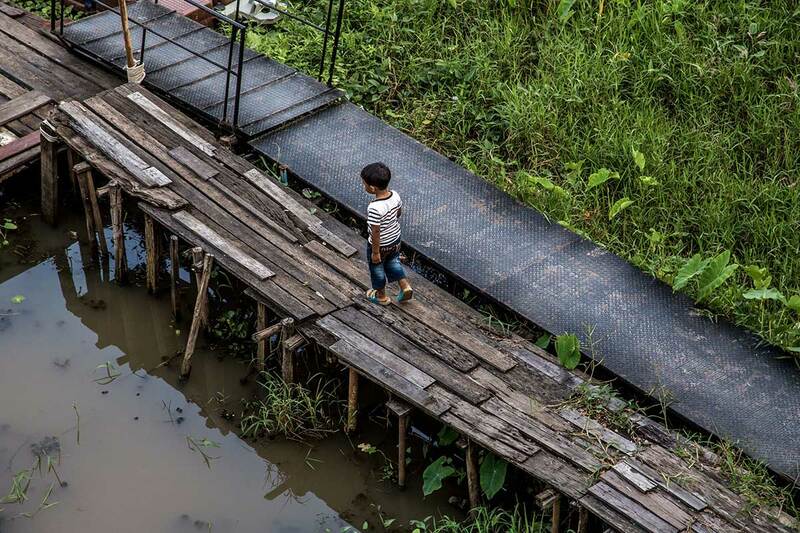 In Kanchanaburi, we visited the relics of the Thailand and Myanmar’s darker past. Under Japanese occupation, 60,000 Allied prisoners of war were conscripted to build the tracks. 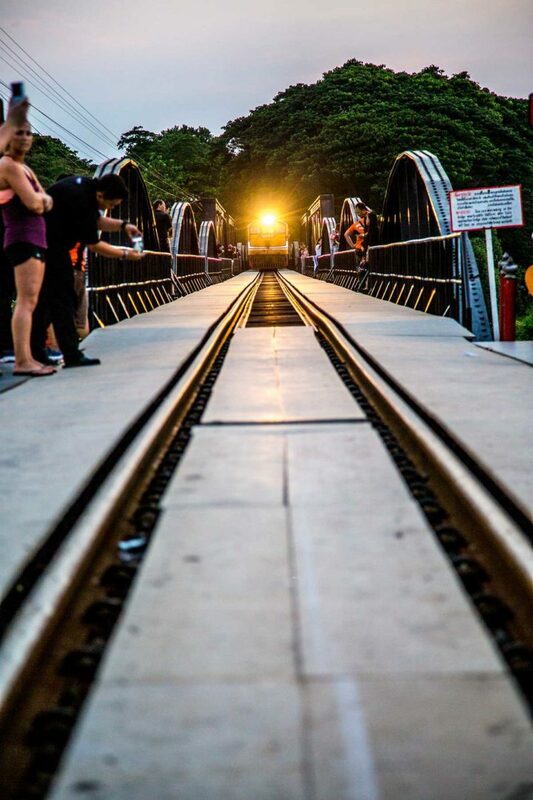 The railway that connects Thailand runs along the new River Kwai bridge in Kanchanaburi. Exact numbers are hard to verify, but it’s said that 16,000 POWs and 100,000 Southeast Asian labourers would die as part of this inventive and sadistic initiative to expedite the building of a railway that was positioned to shuffle troops and supplies across Japan’s newly acquired territories. The railway was originally estimated to take six years of construction. But that was far too long for the Japanese, who looked at their captured and devised a plan to cut the project time in half. This “project” would last two years. Life on the River Kwai. Worse was that the POWS were kept under Samurai code, which the Japanese troops themselves followed, interpreting imprisonment as a disgrace and concluding the only honourable consequence of capture was ritual suicide. Failure to commit suicide meant that the POWs were unknowingly signing a one-sided agreement to be treated as subhuman—a rhetoric that knew no borders during the Second World War. The conditions under which they built the bridge reflected this notion. With little food rations, no hygiene, 18-hour days of hard labour and long nighttime marches, many men succumbed to beriberi, dysentery, starvation, cholera and malaria. At the war cemetery just down the road, we walked among their graves. Again, I counted. Again, I tried to read the name, age and inscription of every soul lost. We passed through the manicured lawn, beyond the obelisk and to the headstones signed “Love, Mom and Dad.” These soldiers were less men, more boys. Still sons, not yet partners. Still in their early twenties, most were the age of my younger brothers. While the plight of these men was popularly chronicled in the book turned movie, The Bridge on the River Kwai, I first read about the death railway in Richard Flanagan’s The Narrow Road to the Deep North. 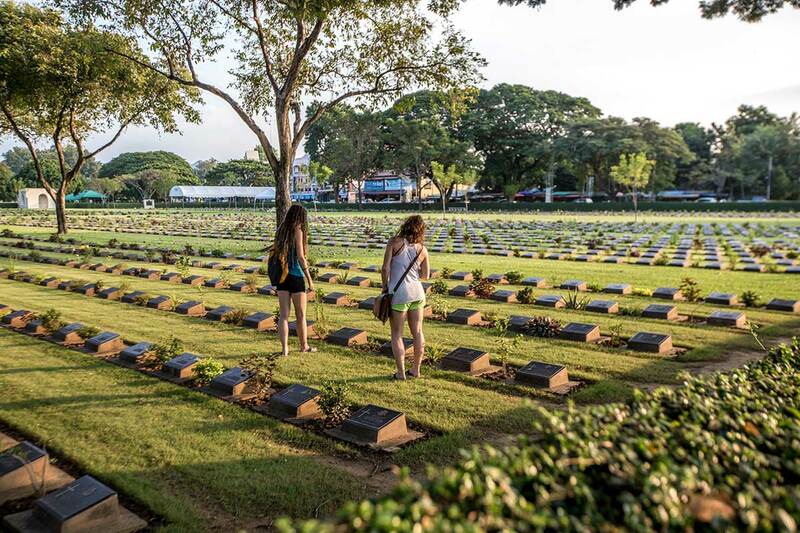 Lena and Sue walk among the graves in Kanchanaburi’s war cemetery. Tourists snap selfies on the bridge. The original sections are just feet away, but no one takes pictures of them. I don’t understand any of this. I can’t fathom what these men went through. I hope never to know. I don’t understand how things could get so out of control. I don’t understand the darker twists and turns of humanity. We might not truly remember anything, but I do think it’s important we try.